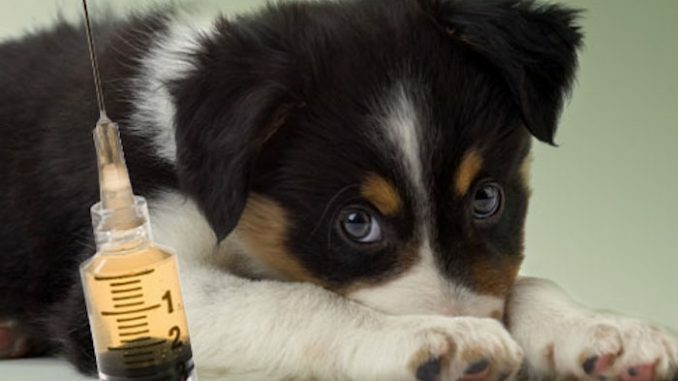 As far as Big Pharma are concerned, a fool and his money are easily parted, and pet owners are proving as easy to swindle as young parents.Just like vaccinations for humans, the number of scheduled vaccinations cats and dogs now receive has gone through the roof compared to previous generations. As a pet owner it is so hard to fight the pressure to vaccinate, especially if you have to board your animals. I rely on the homeopathic remedy “Lyssin” for rabies since it is required by law. They would have me vaccinate every 6 months for Bordatella and Parvo so I had a naturopathic vet write a letter saying we do titers to put in my dogs file now we don’t have to do all the other ones. There are many natural ways pet owners can combat the effects of forced vaccinations, currently rabies is the only one we have to worry about.